The back-to-school season is quickly approaching, and your car will soon face many obstacles—from harsh weather conditions to the messy carpool kids. Start the school year off right with a complete auto detail from Rick’s. Not only can an exterior detail protect your vehicle in the coming months, but an interior detail will completely transform the inside of your car (especially if that beach sand is still lingering). 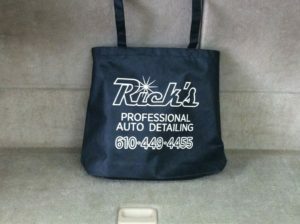 For a limited time, we are offering a FREE Rick’s tote bag to customers who purchase a complete detail. It’s perfect for keeping in your car for a trip to the grocery store or to the beach. Call (610) 449-4455 to schedule your detail today. *Correction 8/6: If you got to this page from the newsletter, we apologize as there was a typo saying, “We are currently offering a free tote bag to all customers who purchase a free detail, while supplies last.” It should read who purchase a “full detail” while supplies last. We apologize for the confusion.